How about that Democratic National Convention? While the Left heaped praise on Bill Clinton’s speech, media generally opined that President Obama’s was muted and relatively unimpressive. No promise of a sweeping agenda, but a plea to hang on because things are moving in the right direction. Never mind that, per the historical record, the recovery should be moving much more briskly. One of the most memorable moments of the President’s speech came when he attacked Mitt Romney for being “stuck in a Cold War mind warp.” As he tells it, Governor Romney wants to return to a time of “blustering and blundering.” This is a rather unfortunate way for President Obama to describe the most significant–and a greatly triumphant–chapter in American history. This past Spring, Mr. Obama made a choice of sorts when he announced his flexibility for Mr. Putin after the election. Granted, Russia is not the committed ideological foe it once was, but it has hardly been a global Boy Scout either. There is another way in which Obama erred by his “mind warp” comment. 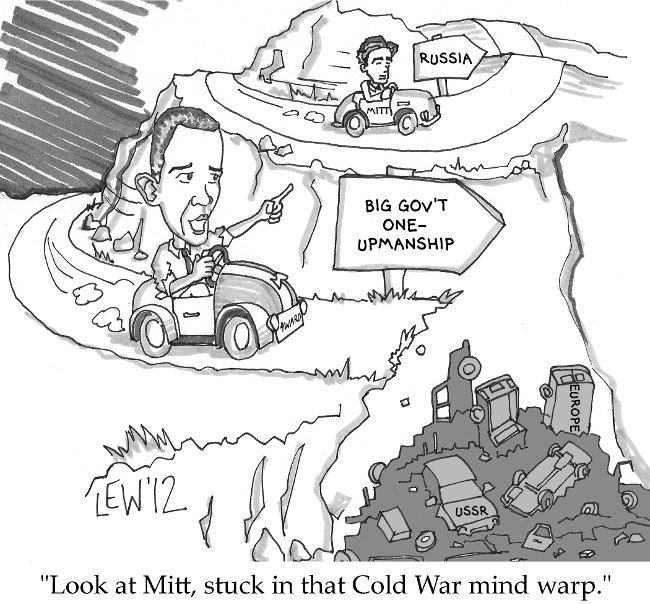 The Cold War was not just an arms race, but the ultimate game of statist one-upmanship. Recall Lyndon Johnson’s “Great Society.” The world’s superpowers were out to win prestige in every arena, including who could build the biggest, shiniest welfare state. In large part, the heavy expenditures and extensive central planning required for this contest buried the Soviet bloc. Even social democracies like the once mighty Great Britain had to change their tack. In America, the 1970s shocks of the OPEC crisis and stagflation disabused many of the welfare state utopia. President Reagan proclaimed the following decade: “In this crisis, government is not the solution to our problem; government is the problem.” And in the 1990s President Clinton conceded, “the era of big government is over.” And in the time since, conservative governments from Scandinavia to Canada have improved their economic fortunes by shifting policy to the right. Of course there are those who still haven’t gotten the memo. It would seem that President Obama, who has yet to demonstrate meaningful concern for the debt, is one such person. When it comes to engorging the superstructure of the welfare state, Mr. Obama has shown himself to be the one stuck in a Cold War mindset. Great post! I too felt that the Soviet Union’s extensive social programs helped bring about their downfall. When Reagan baited them into an arms race, the Soviet Union didn’t have the money to keep up and they imploded. SDI (Star Wars), while having many technical problems that probably would’ve made it impossible to work, helped bankrupt the USSR as they tried to beat us to this.